The crabapple tree refers to the name Crabtree. The upper part of the shield resembles a bridge, and, as such, makes a reference to Mr. Crabtree’s career as a civil engineer. It also refers to the castle in the arms of his birthplace, Exeter, England. The white roses symbolize Mr. Crabtree’s ancestral home of York in England, and the red rose indicates Lancashire, where the family was located by the 17th century. The daffodils are a Welsh symbol and thus honour Mrs. Elaine Crabtree’s heritage. The trillium flowers are the symbol of Ontario and make reference to Mr. Crabtree’s career with the provincial government, especially with the Ministry of Environment and the Ministry of Government Services. 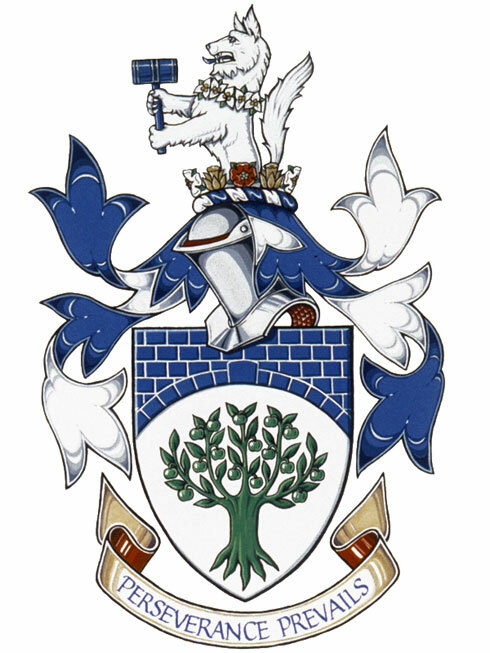 The wolf is one of the supporters of the arms of Cheltenham College, Mr. Crabtree’s school. The gavel indicates his volunteer activities with Toastmasters International and the Toronto Chapter of the American Institute of Parliamentarians.